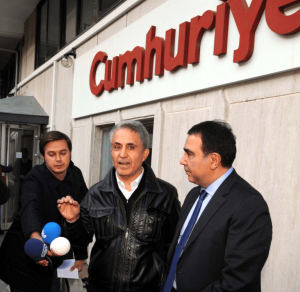 Cumhuriyet is the only major independent newspaper remaining in Turkey, and the case is seen as virtually the last stand for free press in that country. President Recep Tayyip Erdoğan has used last year’s failed coup as cover for a purge of media outlets, universities and the military and judiciary, ousting people claimed to be supporters of exiled cleric Fethullah Gülen. Turkey’s government has accused Gülen followers of plotting the coup and relabeled them as a terrorist organization, FETÖ. Kart and his colleagues are charged with “aiding and abetting” FETÖ–an accusation that Erdoğan has leveled against independent journalists with abandon. About 150 journalists are currently jailed in Turkey, and 173 media outlets have been shut down or taken over by the government in the past year. I have had the privilege of being Cumhuriyet newspaper’s cartoonist for twenty-three years. If some unprejudiced research had been conducted in this case it would have been seen that my signature is there, under the most scathing cartoons of terrorist organisations, primarily those of FETÖ. And the fact that these anti-terrorist cartoons have appeared on the front page for the last six years is further proof that my paper should not be held up as being aligned with a terrorist organisation. Kart has long been a critic of Erdoğan, winning the 2005Courage in Editorial Cartooning Award from Cartoonists Rights Network International after he successfully fought a lawsuit over a cartoon depicting the then-Prime Minister as “a kitten entangled in a ball of yarn.” In 2014 he was againacquitted after Erdoğan sued over another cartoon that criticized his apparent role in a graft scandal. If convicted on the current charges, he could face up to 29 years in prison.